Holy Trinity is a parish church of the Church of England, meaning that it seeks to serve the district in which it stands. We aim to serve not only the residents of the area, but also those who work or study at the colleges and institutions nearby, and all who visit, from home and abroad, the Royal Albert Hall, museums, and parks. Many of these are a legacy of the Great Exhibition of 1851, motivated by Prince Albert, the ‘Prince Consort’ of our address. Our church building is of architectural importance (grade 1 listed) designed by the famous Victorian architect G.F.Bodley. But the architecture gives an opportunity for quiet reflection when the building is open and a supportive space for public worship. As a Christian community we are small in numbers, but large in heart! We welcome you to spend some quiet time in the church when it is open (see below) and hope that you will join us at our services, both traditional and modern. We offer distinctive Anglican worship at Holy Trinity, to which all are welcome, regardless of denomination. On Sundays, at 11am, the service is either a Choral Eucharist, or Choral Matins (followed by Holy Communion at 12.15pm), according to the Book of Common Prayer and using the King James Authorised Version of the Bible. On Wednesdays, at 1.10 pm, there is a said Eucharist using Common Worship. We are pleased that, on certain Wednesdays in term time, Choral Evensong is sung by the Imperial College Chamber Choir. Please see the calendar for details. Seasonal evening services are also held at or around the Church’s greater festivals, especially an Advent service, a traditional Christmas Carol Service, a Eucharist at Epiphany and Ash Wednesday; and special services for Holy Week, Easter and Ascension Day – for details see ‘News’ and the calendar on our Worship and Services page, where further details can be found. We are one of at least three ‘Holy Trinity’ churches in the local area, and confusion sometimes arises! ‘Holy Trinity Prince Consort Road’ identifies us by our actual postal address, but the official name of the parish is ‘Holy Trinity with All Saints South Kensington’. All Saints is in Ennismore Gardens, and served a separate parish until it was closed for Church of England worship in the mid-twentieth century; it is now a Russian Orthodox cathedral. In the context of local government, by a quirk of history, we are actually in the Knightsbridge / Belgravia ward of the City of Westminster not the Royal Borough of Kensington and Chelsea as perhaps implied by our official title. We are committed to opening the church as much as possible as part of our engagement with the Diocese of London’s Capital Vision 20:20. We are always open on Wednesday afternoons between 2 – 4pm, and sometimes later. Visitors appreciate the splendour of the architecture, but also the quietness of the church, both of which gives opportunity for reflection and prayer – or just a rest during the busy day and from the world outside! There is also an opportunity to light a candle as an expression of your private cares and prayers. And of course we are open on Sunday mornings for our main service! 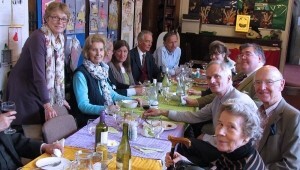 Good food and company at our Parish Lunch, prepared by members of the congregation, make this a happy regular event in our life – and all are welcome to join us, even at the last minute – we have not yet run out of food! This is held most months (excluding August and September, and around Easter) after the morning service on the second Sunday of the month (but please check calendar to confirm). On Sundays when the service is a Choral Eucharist, please join us for coffee and tea afterwards in the church; this gives an opportunity to meet each other socially. Liz was appointed Priest-in-Charge here in 2008 after serving in Alton (Hampshire) and St Martin-in-the-Fields. Before training for the ordained ministry, she worked for the BBC Proms at the Royal Albert Hall, so knows the area well from two very different angles! She is also one of the Directors of Ordinands for the London Diocese. Peter was ordained in Southwark Diocese and worked in parishes in south west London (where he still lives) for 10 years, before moving to non-stipendiary ministry and working in local government. Now retired, he started to assist at Holy Trinity in 2002 while attending the Proms as a season ticket holder. Leslie has been based here since 2007 and is a retired City of London Livery Clerk. He is still very active in the City civic life and is a member of the Third Order of the Society of St Francis. The BBC recently celebrated the 90th anniversary of broadcasting Choral Evensong. Christopher Howse, writing in the Daily Telegraph about this, ended his article by saying ‘For those open to the possibility, it can be a form of prayer’. It is to be hoped that ending his observations thus was meant to be ironic, or else it is the best throw-away afterthought since Genesis 1:16 (‘… and he made the stars also’)! Choral Evensong at Holy Trinity, sung by the Imperial College Chamber Choir, is a deeply prayerful occasion: splendid music – yes, enthusiastically but lovingly sung by the students, along with the Biblical readings of the day and prayers, all in a quiet atmosphere as night falls, gives us the opportunity to reflect on the day now ending, offer ourselves and all our concerns to God, as well as to spiritually ‘tune in’ to the musical settings of psalms, canticles and anthems. Do join us on October 19th, then fortnightly on November 2nd, 16th and 30th. 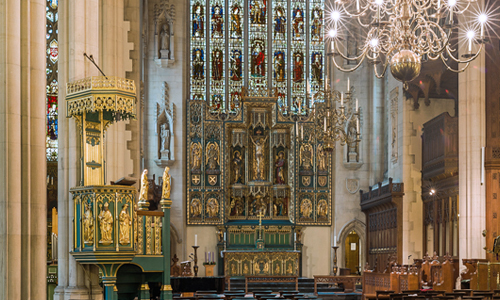 All registers for the former churches of Holy Trinity Knightsbridge and All Saints Ennismore Gardens are held at the Westminster Archives, as are those for the following ceremonies at Holy Trinity: Baptisms up to the end of 1997, Confirmations until 1948, and Marriages until 1949. 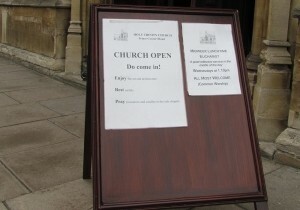 Please contact us if you wish to consult registers held at the church – the most convenient time is on Wednesday afternoons, but it is best to confirm your visit in advance. Please also note that a fee prescribed by law may be payable for a copy of entries. Holy Trinity is in the area centred on Exhibition Road. This is sometimes described as ‘Albertopolis’ after Prince Albert, spouse of Queen Victoria, who was the inspiration behind the Great Exhibition of 1851 in Hyde Park. The proceeds of this funded a large number of educational and cultural sites, including the Royal Albert Hall, the Royal Geographical Society, Imperial College, the Royal College of Music, the Royal College of Art and, further south, the Victoria and Albert, Science and Natural History Museums. We are proud to be the parish church of this wonderful heritage and value our connections with the institutions. For further information about any of these institutions, please see the websites given on our ‘Links’ page; and if you are a member of staff or otherwise connected with any of them, please be in touch if you think we can be of any assistance. In the last few years we have been pleased to host diploma exhibitions by post-graduate students at the Royal College of Art. The church has proved to be a flexible space for such events and often produces a stimulating discourse between art and spirituality. We hope to provide some pictures here of these events; if you feel we might be able to host an exhibition, please be in touch with us. The church has a portable ramp making the entire building, including lavatories, accessible to people who use a wheelchair. There are no steps inside the church so there is clear access to the altar rail. There is a T-loop system in the church (not hall). Large print orders of service are available.